Now that Halloween and Bonfire Night are out the way, I feel like I’m legitimately allowed to mention the C-word. I’m not normally one to plan the festivities too far in advance, but since a certain little person arrived in our lives I’ve been looking forward to his first Christmas and the magic it will bring. There’s a stocking embroidered with Nino’s name that I’m hoping will last a lifetime, his very first decoration for the tree (we have a tradition of getting a new bauble or item to hang every year), matching jumpers to wear, stories to read and a long list of presents to buy, even if he’s (inevitably) more interested in the the boxes they arrive in. And then of course – although I’m not allowing Nino refined sugar til he’s one (mean mummy) – there’s dessert to plan for the grown ups in attendance. Every year I’m tasked – ok, I task myself – with making a Christmas dessert. Not everyone – alright, me again – loves the traditional Christmas pudding and cake, so it’s nice to have an alternative up your sleeve. In years gone by we’ve had a sugar snow-dusted chocolate log, chocolate orange tart, chocolate cranberry cake and a chocolate chestnut torte. You may be sensing a theme and while some might say a chocolate dessert could be a little rich to follow an enormous Christmas roast, I feel like it’s the one day where you’re in for a penny, so you might as well go in for a pound. Or gaining several, at least. 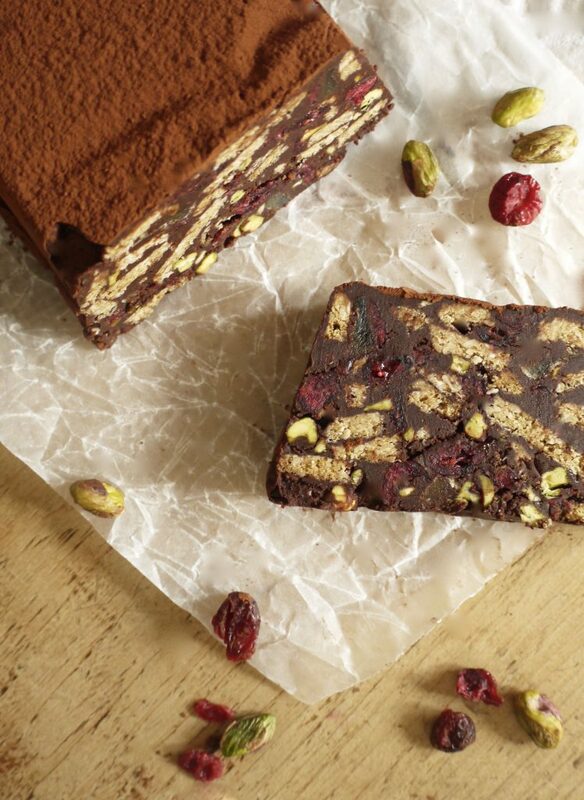 I developed this festive chocolate biscuit cake for The Secret Truffletier to showcase some of their delicious chocolate products and I have to say it’s a strong contender for this year’s Christmas pud. 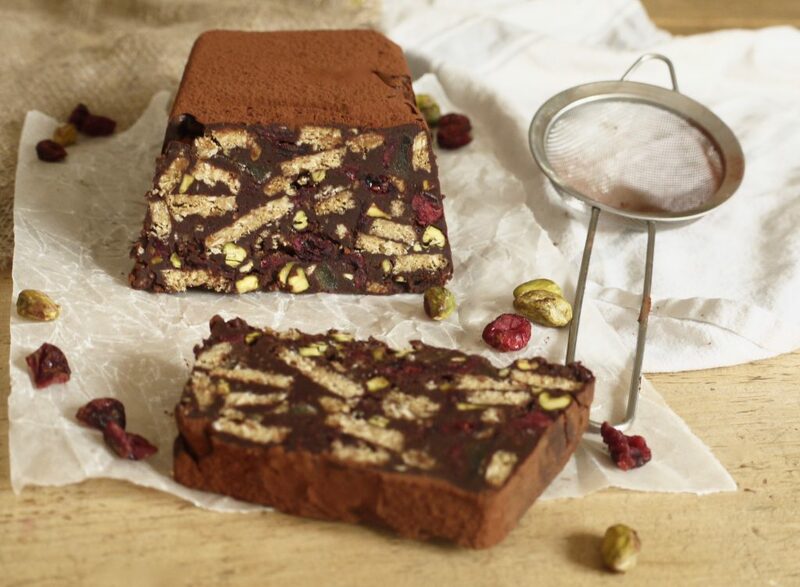 It’s indulgent enough to enjoy as dessert, can easily be sliced and served at tea time as an alternative to Christmas cake and would also be the perfect way to use up any leftover dried fruit, nuts and chocolate during those glorious last days of December when you’re trying to cram in as many treats as you can before the New Year New You guilt kicks in. 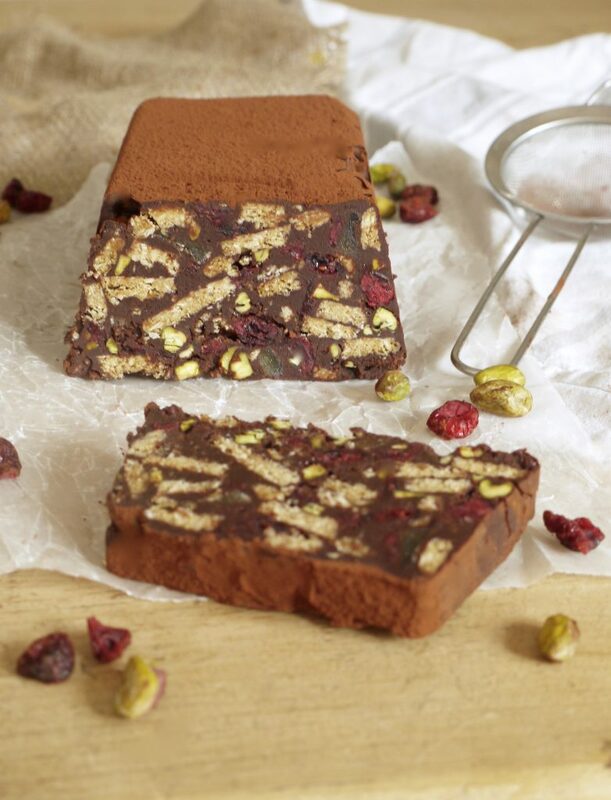 There’s warmth from ginger in both biscuit and crystallised form, crunchy pistachios and chewy cranberries all set in a truffle-like chocolate cloak. You might like to cut this cake into thin slices as it’s rather rich, but we’ve been serving up great slabs in the interest of adding some insulation as the colder weather draws in. To continue the spirit of all things festive, the lovely people at The Secret Truffletier are also offering one lucky blog reader the chance to win a hamper of chocolate, perfect to treat yourself or give away as a Christmas gift. The hamper contains all sorts of chocolate goodies (most of which I’ve had the pleasure of sampling, and they’re seriously good) including Milk Chocolate Almond Clusters, Mini Chocolate Reindeer, a Mulled Wine Truffle Tree, Boozy Truffles, Christmas Puddings, Drinking Chocolate and more. To be in with a chance of winning, simply comment below telling me your favourite dessert to eat on Christmas Day. 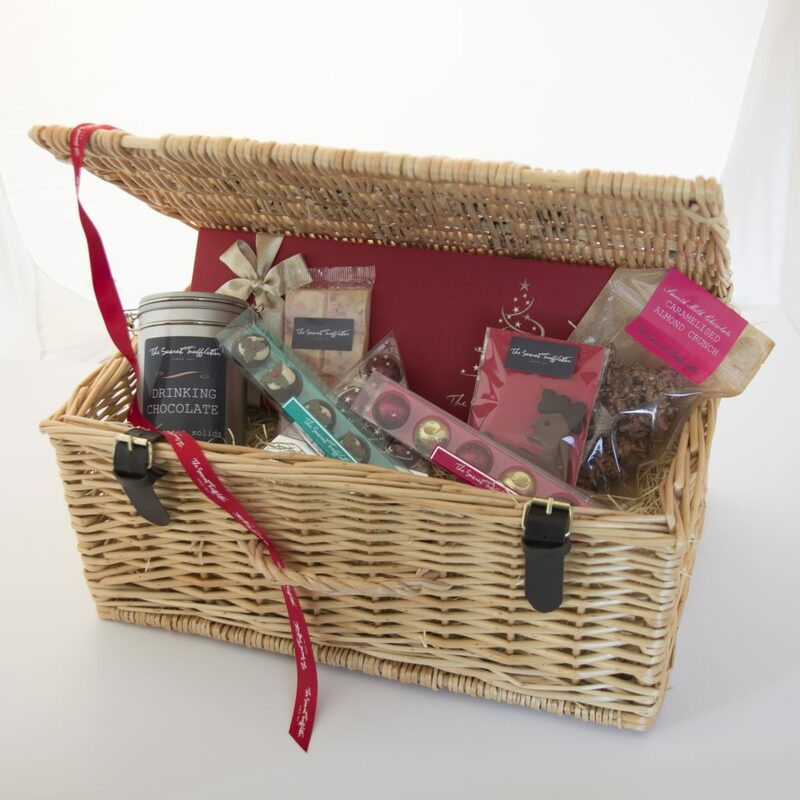 A winner will be randomly selected from all entries on Monday 21st November with the hamper dispatched to arrive in plenty of time before the big day. To find out more about The Secret Truffletier, click here. Please note that this competition is open to UK readers only due to delivery. Good luck! Grease a 1kg loaf tin with butter then line with baking parchment. Combine the chocolate, butter and golden syrup in a large heatproof bowl suspended over a pan of simmering water, stirring gently until melted and smooth. Remove from the heat and allow to cool for 5 minutes. 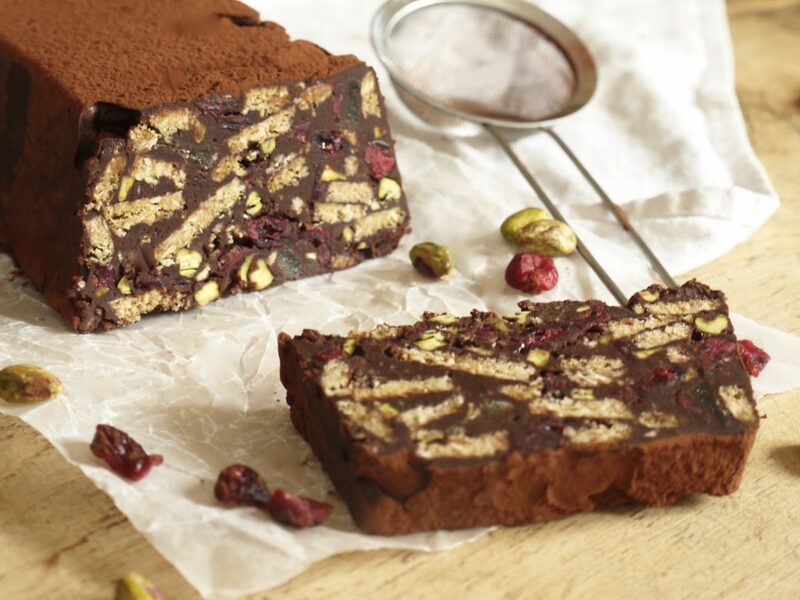 Slowly and continuously stir the beaten egg into the chocolate mixture to pasteurise it, then fold in the biscuits, pistachios, cranberries and ginger, making sure each piece is evenly coated in chocolate. Scrape the mixture into your prepared tin, smooth the surface flat then refrigerate until firm, 2 – 3 hours. When ready to serve, remove from the tin, peel off the parchment paper and dust with cocoa powder. Cut into thin slices – this cake is very rich! Brandy butter. My Mum has a recipe for it she’s been making since she and my Dad got together, and while I don’t like Christmas Pudding, I take a tiny spoonful so I can fill the rest of my bowl with sweet, boozy butter! 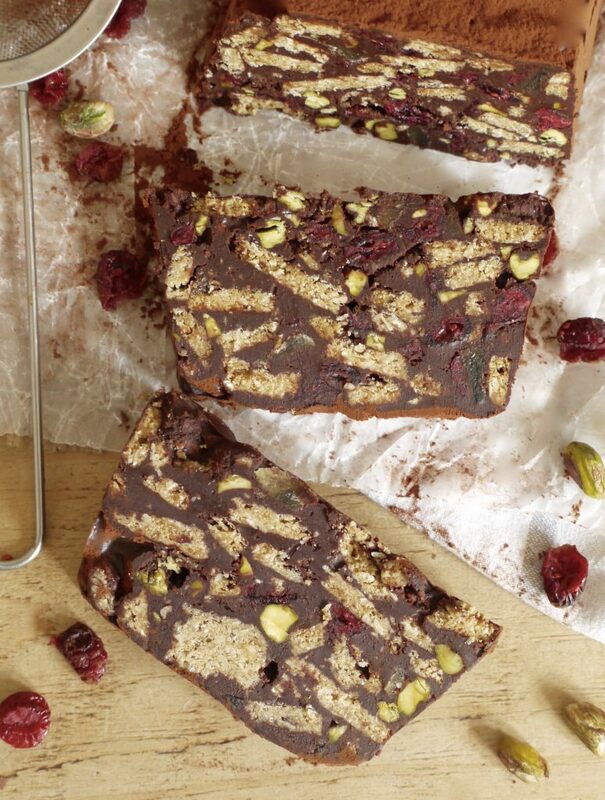 Ooh love chocolate biscuit cake, the addition of ginger biscuits and dried cranberries looks lovely. We always have Clootie Dumpling for Christmas puddy, its a steamed pudding which is cooked in a flour-dusted ‘cloot’ (cloth) and takes hours to steam and a lot of watching to ensure it doesn’t boil dry. It’s then heated up on Christmas Day and served with good old fashioned powdered custard or cream with the family charms wrapped in greaseproof paper – the black cat I think is the luckiest one but there’s also a horseshoe and plenty pound coins too! Love traditions like that, would be heartbroken if it wasn’t served up. Think I need to bite the bullet and get my mammy to teach the recipe – she knows it so well she mostly makes it by sight and barely weighs anything! Biscuit cake looks gorgeous by the way! We sometimes take a break between dinner and dessert on Christmas day to make space for our home-made Sticky Toffee Pudding (the recipe tends to get customised slightly each year) with madagascan vanilla ice cream, it’s becoming a bit of a tradition for us now. Sinfully indulgent but worth every single mouthful…sticky fingers and all! After the Christmas pudding always being left looking rather lonely and untouched my dad decided to turn it into Christmas pudding soufflé and a Christmas pudding ice cream. Nothing goes to waste an altogether lighter and more appealing dessert was born. Looking forward to trying out this recipe on the in-laws this weekend! Ice cream Christmas pudding from a 70s recipe! My mums Christmas Pud, she makes it weeks before, then we cook it on the day in a very old steamer! Delicious! I always make a Christmas pudding on stir up Sunday. Last year I tried a new recipe with figs and it was delicious. I’ll be making it again this year but I fancy giving this a try for the non-Christmas pudding lovers. We have never managed to get the pudding to arrive with the blue flames though! It’s always got to be a sticky toffee pudding. The best dessert hands down. I love a lemon tart after Christmas dinner.. it’s light and it doesn’t make you feel even more sick so it’s perfect! Christmas pud and sticky toffee pud with loads of toffee sauce. After all it is Christmas!!!! It has to be a chocolate Yule log! Can’t beat a homemade one decorated with chocolate santas! Christmas pudding! Home made by me, from my great grandmas Good Housekeeping book -which is literally falling apart at the seams-on Stir up Sunday before being transported to my mum and dads for steaming the same Day. Served up at Dr who o’clock (once dinners had a time to digest!) on Christmas Day with the only cream I have all year.